Democracy for America helped Donna Edwards become the first African American woman to represent Maryland in Congress because she has a strong progressive vision for an economy that works for everyone. Rep. Donna Edwards is the perfect fit to follow in Sen. Mikulski's footsteps -- which is why the progressive movement is rallying to draft her into the race. On Wednesday, Donna said on MSNBC that "I'm seriously considering it. And, you know, I think it’s important to follow on (Sen. Mikulski's) legacy of leadership for women and leadership in the Congress. … I think I could fill that bill." But Donna hasn't made a decision yet -- and she is definitely not the only Democrat considering jumping in. 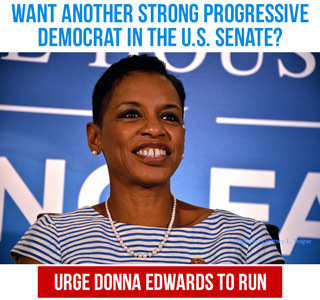 That's why DFA is joining with the Progressive Change Campaign Committee, Blue America and Maryland progressives to urge Donna Edwards to run for U.S. Senate. Add your name now -- and let Donna know you have her back. (OPTIONAL) Can you give us a statement we could release publicly on why you think Donna should run?